Replaces all of Dometic's® "black box" boards Beginning With Part # 293xxxx. Universal Fitting 2-Way & 3-Way, AMES, AES, Adjustable-Temperature & Fixed Temp Refrigerators. Works in 2-way (AC, gas) and 3-way (AC, DC, gas) units with all types of eyebrows. It features an improved thermocouple circuit to eliminate the recurring check light problem. A food saver keeps the refrigerator operating if the eyebrow board or communication link fails. A temperature control knob allows you to choose the full temperature range on fixed temperature refrigerators. It also allows for"aging" compensation in the units that have a 1-2-3-4-5 temperature adjustment panel. Fuse protected on the 12V DC supply, DC element and 120V AC circuit. Simple installation, works in units with or without the wiring upgrade kit and includes detailed instructions. 2-Way, 3 Way, AMES, AES, Adjustable-Temp & Fixed Temp Dometic Refrigerators With The Following Models : NDR1062, NDR1272, NDR1282, NDR1292, NDR1492, RM2551, RM2554, RM2607, RM2611, RM2612, RM2652, RM2807, RM2811, RM2812, RM2852, RM3607, RM3662, RM3663, RM3807, RM3862, RM3863, RM4872, RM4873, RM7030, RM7130, RM7732, RM7832, S1521, S153, S1621, S1631, S1821, S1831. Overall Box: 5-7/8" x 4-5/8" x 1-1/2"
i have a elkhorn truck camper with a dometic rm3663 royale 3 way. since i have had it,( several years) the fridge has give me problems while running on propane. check light comes on flame goes out. sometimes after 5 min, 20 min.....random. never for days at a time. since installing the the P-711 one in my dads camper and one in mine, they never ran this long and this well (a week). the install was easy once i understood the directions. 1st took 20 min, 2nd took 5 min. lots of fuses means more protection,i like the temperature control,(my frig only had one setting,$40. cheaper than buying it locally,will it last ?,time will tell,fast shipping. Ordering of the control board for my dometic refrigerator was never easier. Delivery was fast. The part was just what I needed and fit perfectly. The only small problem was the diagram for hooking it up. It was a little confusing at first as it did not say " place J1 to J1 or J2 or whatever" and removing the extra wire needed for the new board from the existing wiring harness was a little vague. But I figured it out and had it running in less than an hour. It is now running fine. 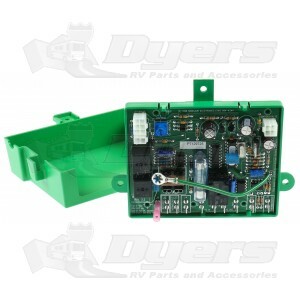 Thank You for your fast and professional service and in the future, when and if I need something for my RV, I will be going to Dyers RV for my products.